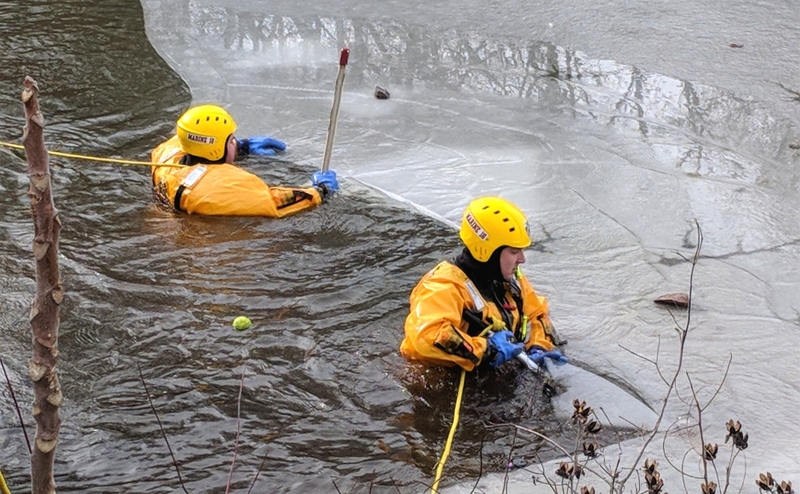 Collingswood firefighters work to save a dog from the frozen Newton Creek. Credit: Matt Skoufalos. The pet went missing on her daily walk, and was recovered, unconscious, after an hourlong search in frozen conditions. Collingswood Firefighters Kevin Ehret and Harold Mitten search for a missing dog in Newton Creek. Credit: Matt Skoufalos. Collingswood firefighters searched for a missing dog in Newton Creek for more than an hour in freezing temperatures Thursday morning before finally recovering it, unconscious. The animal, an eight-year-old Labrador retriever named Kona, had slipped into the water a little after 11 a.m., according to her owner. The dog was believed to have been chasing a tennis ball on her morning walk. Belayed by safety ropes from the Bettlewood Avenue bridge, firefighters Kevin Ehret and Harold Mitten retrieved the animal after breaking through sheets of ice in the frozen creek. Firefighters recover a missing dog from Newton Creek. Credit: Matt Skoufalos. A tennis ball bobbed nearby as they worked. The pet was quickly placed into a waiting ambulance, where EMTs began resuscitation protocols. 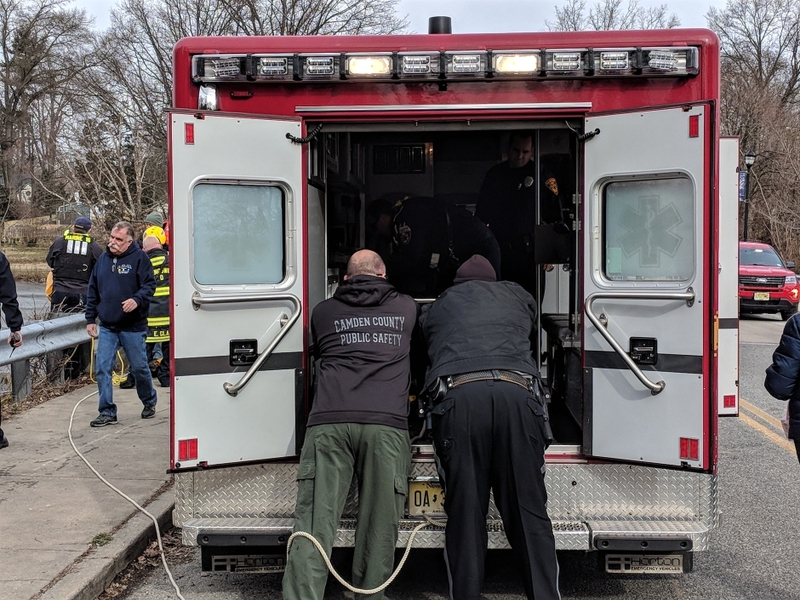 A veterinarian who happened to be at the scene accompanied the dog to North Star VETS in Maple Shade, said Collingswood Fire Chief Keith Davis. Its condition was unknown at the time of transport. Davis later reported that veterinarians attempted to revive the animal, but were unsuccessful. 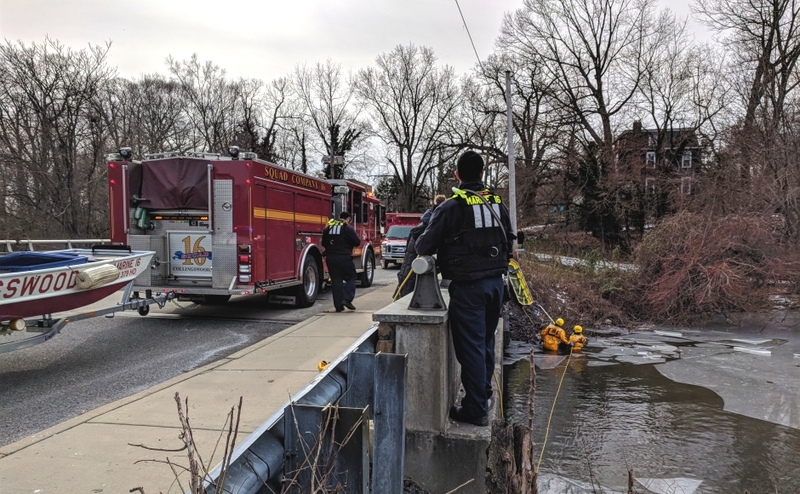 The water rescue blocked off the Bettlewood Avenue bridge for nearly an hour, as first responders from the Collingswood and Westmont fire companies searched for the dog in extreme weather gear. 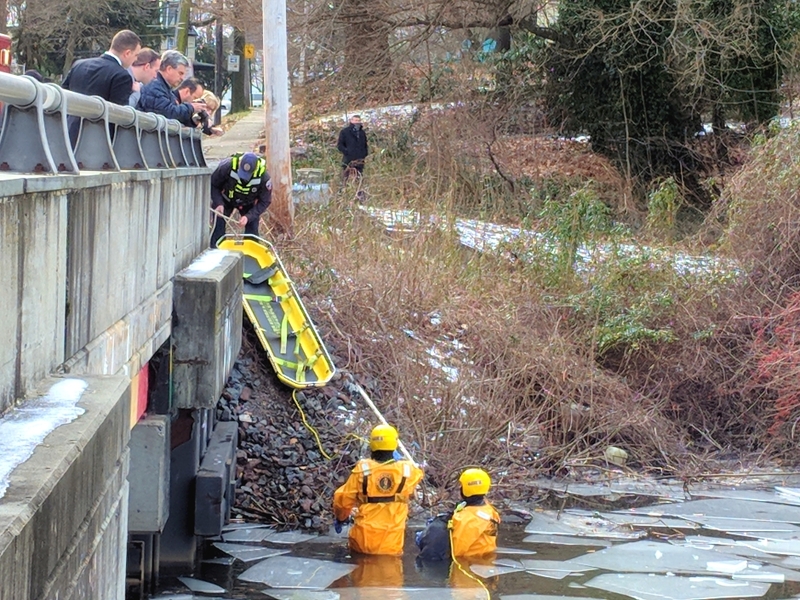 EMTs work to revive an unconscious dog recovered from the icy waters of Newton Creek. Credit: Matt Skoufalos. Davis said that although the conditions were unfriendly, personnel had been well prepared to face them. “We train regularly for these situations, whether it be people or animals,” the chief said. Last year, firefighters from Oaklyn recovered a missing dog from Audubon Park in a similar rescue in Newton Creek.